The weather up there in the wilds of County Antrim can be very unpredictable. By times you might have all four seasons on the one day. Poor Patrick had no thermal underwear, waterproof leggins or hiking boots. There were no thermos flasks, GPS or Quad bikes to help with looking for lost sheep. My header photo above and the one below are taken from the same spot, at most a few feet apart. They are from different years and seasons. All I have done to the photos is crop them. If I give you the dates, can you tell me which photo goes with which date? 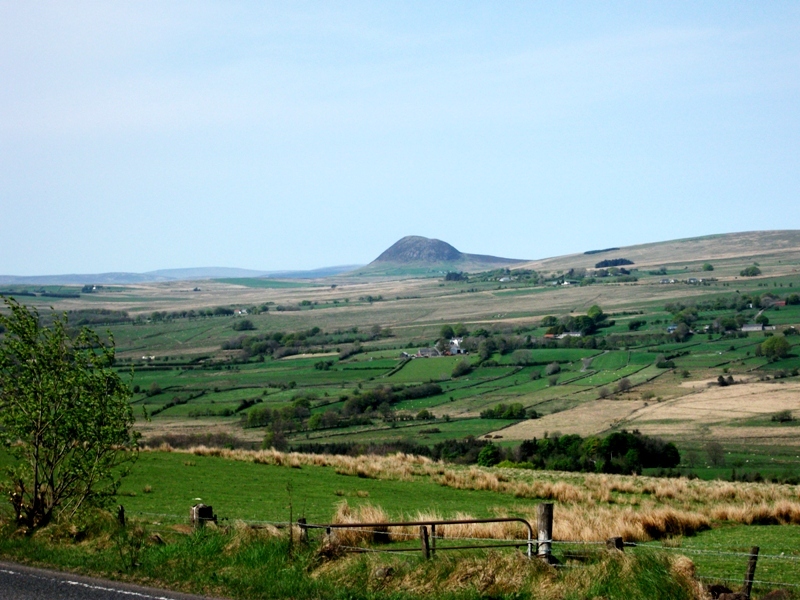 This entry was posted in Ireland, Photography and tagged Ireland, Photography, Slemish on March 15, 2014 by Grannymar. Header is August 2012, and bottom one is January ’09 – but in which season are the fields red…? Second photo from August? Re St Pat…a good guy according to the Irish priests I have known. The church should have listened to him! Dianne, The August photo is the one in the Header. Header is August, Other photo is January. A lot of years, much of our ground vegetation stays green like in your photo. Not this year. Everything is brown from the cold winter, except for daffodils and other bulbs. You got them in the correct order Mike. All the rain is the price we pay for the green, right now it is still a dull dark green. I look forward to the new growth. Nice shots. The bars and restaurants are gearing up for St. Paddy’s day here ~ and there’s a parade on the island tomorrow. The festivities reached a high point this evening, with the news of Ireland winning the Six Nations Rugby tournament for 2014. The final match took place in France. The header image is B, taken on 22nd August 2012. What a beautiful landscape! I think I’d prefer some time in all that lovely natural green, rather than all the artificial hype that seems to take over this time of year. St. Patrick’s Day is a big restaurant/bar “event” and seems little out of control to me. LOL! Must be my age speaking. Hahaha! I am all for a quiet day. In fact it is a normal working day in Northern Ireland, we even have a normal bus service today – Something we do not have on a Sunday. Diageo, who now own Guinness, have Disneyfied the day, No green pints or rivers yet, I am glad to say!